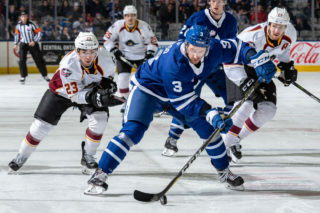 The Toronto Marlies picked up a point in a hard-fought effort at home Sunday, falling 2-1 to the Cleveland Monsters in a defensive duel that required overtime to settle things. Mason Marchment connected on a one-timer after Adam Brooks found him at the dot to the right of the Monsters net and Marchment made no mistake, shooting it top shelf. Timothy Liljegren had the secondary assist on an important first goal for the Marlies who entered play with a 4-0-0-0 record when leading after the first. From that point forward, both teams tightened up defensively and the netminders at both ends turned aside every opportunity. 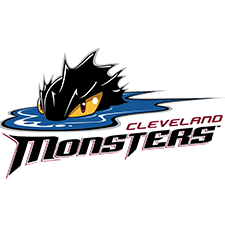 The score remained 1-0 until Sonny Milano scored on a rebound for the Monsters with under two minutes left forcing overtime. Just over a minute into the extra frame, Mark Letestu scored the winner for Cleveland. 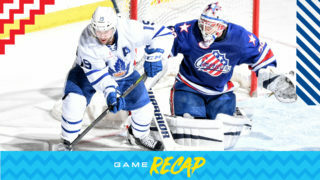 It was the third straight game between the Marlies and Monsters that went beyond regulation and the third consecutive game overall for the Marlies to require extra time. Eamon McAdam made 25 saves for the Marlies while Jean-Francois Berube had 23 stops for Cleveland. The result moves the Marlies to 7-7-2-2 on the season while the Monsters improve to 10-7-2-0. 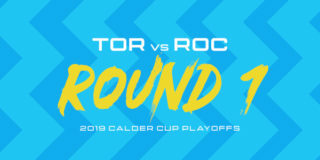 Toronto will head to Cleveland on Wednesday for a third straight matchup between the two sides. That game will be available on AHLTV. Mason Marchment opened the scoring at 12:19 of the first period. This was Marchment’s fifth goal in three games which includes two overtime game-winners. Marchment has 13 points (8 goals, 5 assists) through 13 games this season. Adam Brooks recorded the primary assist on Marchment’s first period goal. This is Brooks’ third consecutive game recording an assist (4). Timothy Liljegren registered the secondary assist on Marchment’s first period goal. Liljegren has eight points (2 goals, 6 assists) through 17 games this season. Eamon McAdam stopped 25 of 27 shots he faced. McAdam is now 3-0-2-1 on the season with a .896 Save Percentage and a 2.98 Goals Against Average. Toronto went 7-for-7 on the penalty kill and 0-for-4 on the power play. This is a season-high for penalties killed by the Marlies. Cleveland had a 27-24 edge in shots in all situations. 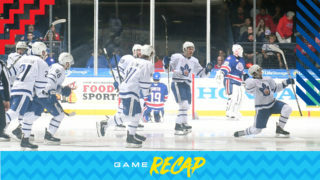 Adam Brooks led the Marlies with four shots on goal. The Marlies are 6-7-2-2 against North Division opponents and are 1-1-1-1 against the Cleveland Monsters this season. The Marlies have been outscored by the Monsters 19-16 with four games remaining this season. Penalty killing was outstanding, gives us a chance to win the hockey game. Obviously makes up for the fact that our power play is … the way that it is and we had an opportunity to really take hold of the hockey game and we failed to do so. But that’s progress for us, the guys really dug in and did a great job there. It’s disappointing. I thought we played, I’ll have to watch it back fully, but it felt like our best period of the season in that third period; from the penalty killing to playing in the offensive zone as much as we did generating some of the looks that we did, certainly deserved to have another goal or two to extend our lead. Right now, we’re close, we’re almost the type of team, but almost doesn’t get it done clearly, but almost is progress and we’re getting there. We’re doing a lot of really good things, we just have to stick with it. The biggest thing is just that he’s continued to play with the same mindset that he had in the playoffs last year, which is that he’s a difference maker and he’s on the puck, he’s been physical, he’s using his body and his strength to win pucks and his line mates getting the puck in good areas where he can shoot it and finish it just as well as anybody we have and it’s good to see him finding the net. 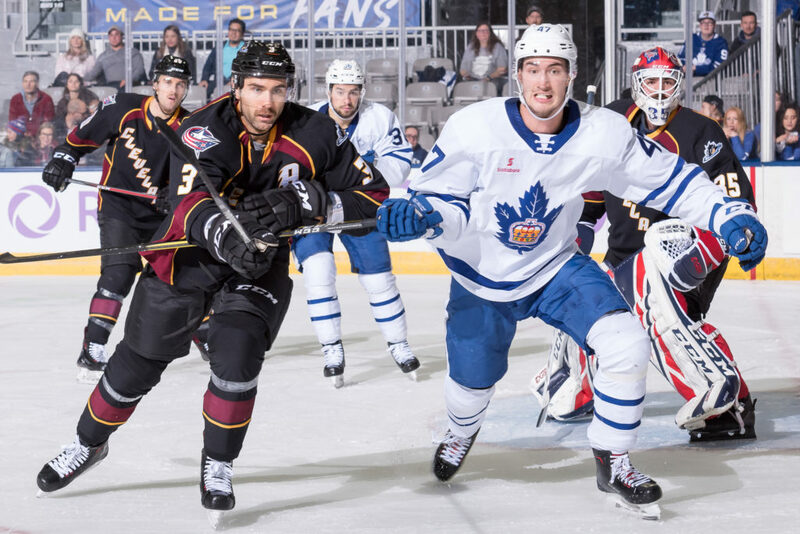 The Toronto Marlies (7-7-1-2) will look to build on a 6-5 overtime victory in Cleveland on Friday night when they face off against the Monsters (9-7-2-0) this evening at Coca-Cola Coliseum. It’s the second of three straight games between the Marlies and Monsters, who will face each other eight times this season following Cleveland’s move to the North Division over the summer. Mason Marchment was the overtime hero Friday night, marking two consecutive games that Toronto and Cleveland have needed extra time to settle things. Marchment and Carl Grundstrom each scored twice in Friday’s game and will look to bring that scoring touch into Sunday. Through three games in the season series against Cleveland, Grundstrom leads the Marlies with 6 points (2G, 4A) and is averaging a point-per-game with seven goals and 15 points. Marchment has 4 points (2G, 2A) against Cleveland so far as do Andreas Borgman and Adam Brooks, who each have a goal and three assists. Chris Mueller’s 16 points (8G, 8A) have him tied for the points lead for the Marlies so far this season alongside Calle Rosen (2G, 14A). For Cleveland, Zac Dalpe had been leading the charge up front as he has 21 points (12G, 9A) on the season, including 8 (5G, 3A) against the Marlies. 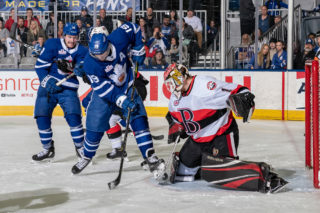 The Marlies enter play having won two consecutive games in overtime and know that a strong start will be a major key for finding success again on Sunday. They are a perfect 4-0-0-0 when leading after the first period, and have only won once when trailing after the first (1-6-1-2). Sunday’s game will be Hockey Fights Cancer Night for the Toronto Marlies, where the team will honour all those who have fought, are currently fighting or have been affected by cancer. Puck drop is scheduled for 4:00 PM and tickets are still available. 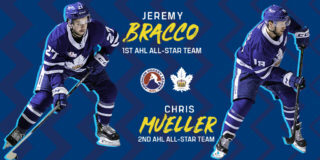 Fans can also catch the action on Leafs Nation Network and AHLTV.